En Papillote simply means cooked and served in a paper wrapper. Foil and parchment paper are the best ways to accomplish this poaching technique. I prefer parchment because the end result is a little more dramatic. This is a great way to serve and impress company while keeping cleanup to a minimum. While the entire dish is cooking, you can be enjoying cocktails with your guests! You can make the pouches individually for each guest to receive their own little pouch, or make the entire dish in one large pouch to serve everyone. They can be assembled in advance and refrigerated while you get ready for your guests. When your guests arrive, just pop in the oven… Simple and divine! Preheat oven to 350 degrees. Roll out a large piece of parchment paper (enough to cover bottom and top of salmon with leftover for folding edges; refer to picture below). Fold parchment paper in half then re-open. Center the salmon on one half of the parchment paper and sprinkle with salt & pepper. 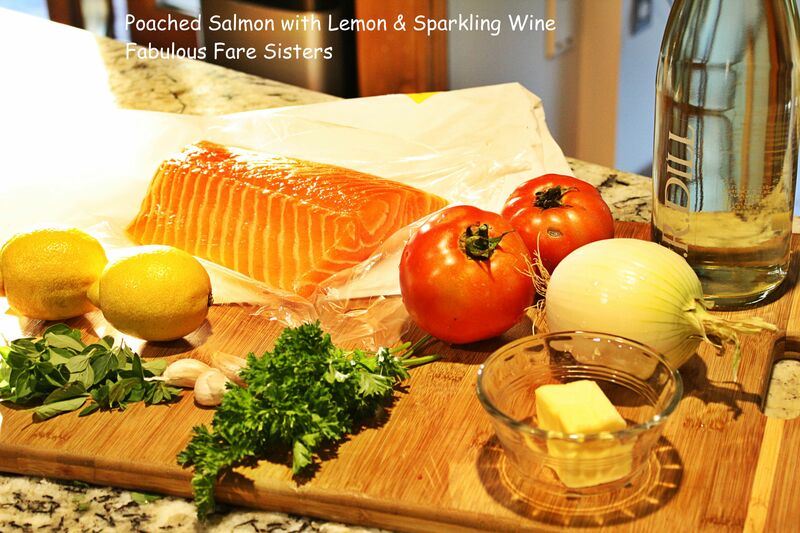 Layer the onions, tomatoes, herbs, butter and the sliced lemon on top of the salmon. Pour the wine and olive oil over the top. Fold the extra parchment half over the top of the salmon. Starting at the edge of one of the folded corners, begin to fold and crimp the parchment all the way around until you have created a pouch that does not allow steam to escape. Bake at 350 degrees for 20 minutes. Let rest in the paper for 10 minutes, then cut open the paper from center of top. Serve with rice for a simple finished dish in no time! I’ve done chicken this way, and it was wonderful. I love Salmon I’m going to try this! I’m bookmarking this page so I can find your recipe. Thank you! It was super moist and full of flavor. The next day I used the leftovers to make a salmon dip for some friends. Very nice ladies! Looks delicious! Thanks, I love lemons too. They add a brightness to everything. This dish is delicious and easy. Just a terrific recipe. My ‘Mirepoix’ would be “Tomatoes, Onions and Lemons”. I use lemons almost every day. Lemons with fish or on Wiener Schnitzel. Looks divinely delicious!